Going into the NFL CBA talks, NFL Commissioner Roger Goodell pronounced that “After speaking to fans, the NFL needs to adopt an 18 Game Regular Season.” The thought that fans don’t like or want to see 4 Pre-season games is a joke, fans want preseason games, as witnessed by the fact that the NFL Network shows every single one of them multiple times. The problem with pre-season games is that they are forced onto season ticket holders who in turn are forced to pay full price for these exhibition games in which the players you cheer for play at most half of the game. After the extreme ugliness of the 49ers and Raiders game at Candlestick Park Saturday night, should prove to the NFL, that pre-season games should be excluded from the “Blackout Rule” and season ticket holders should be given the option to purchase the tickets for these games at a discount or not at all. But as we have learned from the airlines and oil companies, once they start making more money on minimal stuff they will keep it. Take for instance the New York Giants, in 2007 after ground broke for The New Meadowlands Stadium (now MetLife Stadium) the Giants sold season ticket holders on the fact to guarantee parking in The Meadowlands complex would require parking permits and once the new Stadium was complete parking would go back to normal. YEAH….RIGHT, 5 seasons later, invoices for parking permits still come out in May. If the NFL would instruct teams that the preseason games are just that PREseason games and that teams should charge accordingly, season ticket holders wouldn’t mind paying for them. The common practice for people is to either give tickets away to a neighbor or family member or sell the tickets on the ticketexchange or StubHub causes people who normally wouldn’t be able to attend a game the chance to go and what comes next tailgating, drukedness and moronic behavior. The scenes from San Francisco proved just this but to say it only happens in San Francisco or Oakland, is just pilling on at this point. Remember when the Jets couldn’t play night time home games because of the acts of violence at Giants Stadium? Tailgating isn’t the problem either, the problem lies with Stadium security who are simply overwhelmed. An unarmed individual can’t possibily keep every drunken dunce out of the stadium, absolutely impossible. Maybe the punishment for acts of BAFOONERY needs to be stepped up. Just a thought. If the NFL adapts an 18 game schedule I fear for more possible catastrophic injury or God forbid worse during an NFL game. 4 preseason games and 16 Regular Season games are perfectly fine, just don’t kill the fans in the wallet, you already have them at hello, they aren’t going anywhere, well at least not yet. 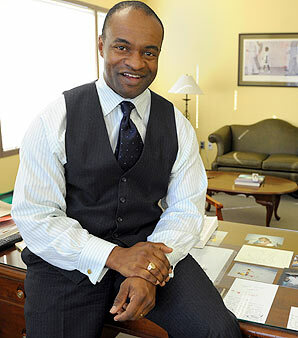 With the NFL Lockout seemingly close to ending, we would like to take a look at 1 of the major players of the NFLPA their Executive Director DeMaurice Smith. 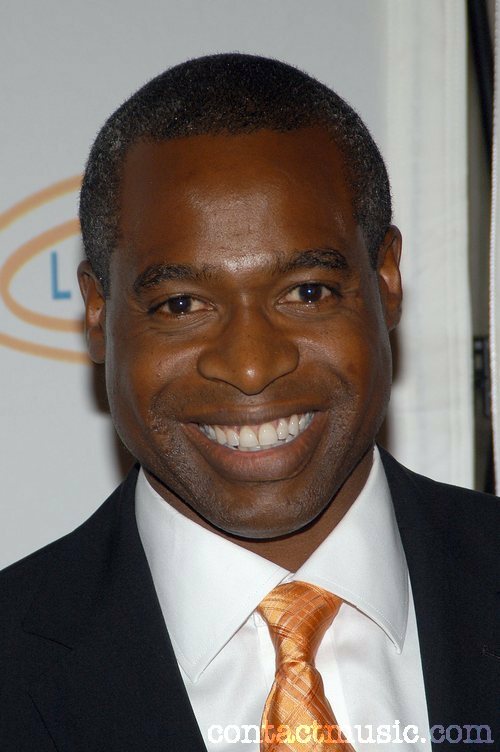 This isn’t a biographical look at him it’s who he is separated at birth from and we feel his doppelganger is Phil Lewis, Star of Disney Channel’s Suite Life on Deck. The Stanford star may be pushing his Luck, but for the right reasons. Andrew Luck is currently my favorite fooball player in the NCAA. Seeing him go number 1 in the 2011 NFL Draft would have been tremendous, but I think Luck made the right decision to stay in school for his senior year to pursue his degree in architectural design. Staying in school will allow Luck to sharpen his skills to become more of a value to the NFL in the future rather than enter the draft this year and be in a position where too much will be expected of him. If Luck did enter the draft, the Carolina Panthers, who own the the first pick, would have been set to select Luck in the first round. Luck’s future with the Panthers, however, would have been messy with a questionable coaching staff and a limited roster. Let’s not forget that Luck now does not have to worry about the possible lockout next season. This season Luck led Stanford to a 12-1 season and passed for 3, 338 yards and 32 touchdowns all while completing 71% of his passes. He threw just 8 interceptions and rushed for 513 yards. In 25 career starts Luck led Stanford to a 20-5 record. Luck finished second in the Heisman Trophy ballot to Auburn QB Cam Newton. Expect Luck to be the preseason favorite entering the 2011 season. Depending on who will come in to coach Stanford, Luck could lead the team to be a national contender. From the looks of it, coach Jim Harbaugh will be taking a $7 million or so deal from a team in the NFL to be a head coach. There have been concerns with Luck returning to school to play another year for fears that he could get injured. Last year he did miss the Sun Bowl with a broken thumb. However St. Louis Rams QB Sam Bradford was also injured in his first game in 2009 and still managed to go number 1 in the 2010 draft. Luck will be a future star in the NFL. He has the ability, arm strength, physical presence, and mindset to work on his skills another year and be an even better contender for the 2012 NFL draft. Rex Ryan: Put up or shut up! I am a Rex Ryan fan. When he came to the New York Jets last season I liked his attitude, his style, and his passion. It has an effect on the fans and the players. However, there is a fine line between passion and talk, and this season Ryan cannot seem to tell the differnce between the two. Last season Ryan kept his team’s spirits up even when they were at their lowest point and got them to play all the way to the AFC Championship game. This season, Ryan chants, “We’re going to the Superbowl,” every week. So far the Jets have not proved to me that they are Superbowl worthy. Yes, the Jets do have an 11-5 record. That is something to take note of. How they came to that record is a different story. After a long summer of talking about Superbowl aspirations, the Jets lost Week 1 to the Baltimore Ravens 10-9. Defense was solid, but the offense looked embarrassing. The beat division rival New England Patriots the following week and won games in the next three weeks. After a bye week they lose to the Green Bay Packers 9-0. Offensive woes re-emerged and defensive issues began. The next two weeks they went into overtime against both the Cleveland Browns and Detroit Lions; teams they should have should stopped from scoring and should have scored more TDs on. They also barely slid by teams like the Houston Texans and Cincinnati Bengals. The Texans have been a challenge for a lot of teams, but the Bengals were a mess this year, and the Jets almost gave them a real chance. Then came the infamous “Game of the year.” The team Ryan called a “must win.” Ryan talked and talked all week about going up to Foxboro and beating the Patriots and making their way closer to the Superbowl. Given the Jets lost to the Patriots 45-3 I guess Ryan did too much talking and not enough coaching. What was Ryan’s response to the loss? He was ready to take his team out on the field in Foxboro right then and there and play the Patriots again. I’m sorry Rex, but what are you trying to prove? Well Rex Ryan, you better be right. At the start of the season I said with all the talk Ryan and the Jets have been doing they better win the Superbowl. I also predicted they make the playoffs as a wild card and lose in the first round. I stand by my prediction. So Rex Ryan if you want me to shut up, then you better put up a fight on Saturday, because the Colts will not back down easily, even if they are missing their best players. If you can’t do that then I suggest you stop talking so much. We are back after our weekend off, and have an interesting Sunday in the NFL to talk about. NHL Action was in full effect with a Rangers sweep of the weekend, and the Devils are reeling. Chris and Scotty break down the weekend’s action. The World Series is set with the Rangers taking on the Giants, we will get you ready for it with analysis and predictions. The Yankees moved Dave Eiland out as Pitching coach, who should take over his job? College Football has a new #1, after Oklahoma went on the road and lost to Missouri.